In real life, people often use mobile phones in the bathroom or kitchen to watch videos, listen to songs, listen to news broadcasts, or do live shows while making makeup. If you want to hold a mobile phone, you can’t do things. Now, we have created a suction cup phone holder that specifically targets the above people and liberates their hands. This product can be placed directly on the table or on the mirror or tile. The product is ergonomically designed and this bracket is perfect for what you want. 1. The suction cup we use is a medium 45mm diameter suction cup with a larger suction. 2, our bracket body material is ABS engineering plastic, can resist falling, even if the shelf falls off, it will not be damaged. Other people’s similar mobile phone brackets use materials that are very brittle and sometimes can be damaged during transportation. use. 3, our stand supports mobile phone vertical screen, horizontal screen, and in terms of size, matching most mainstream mobile phones on the market. 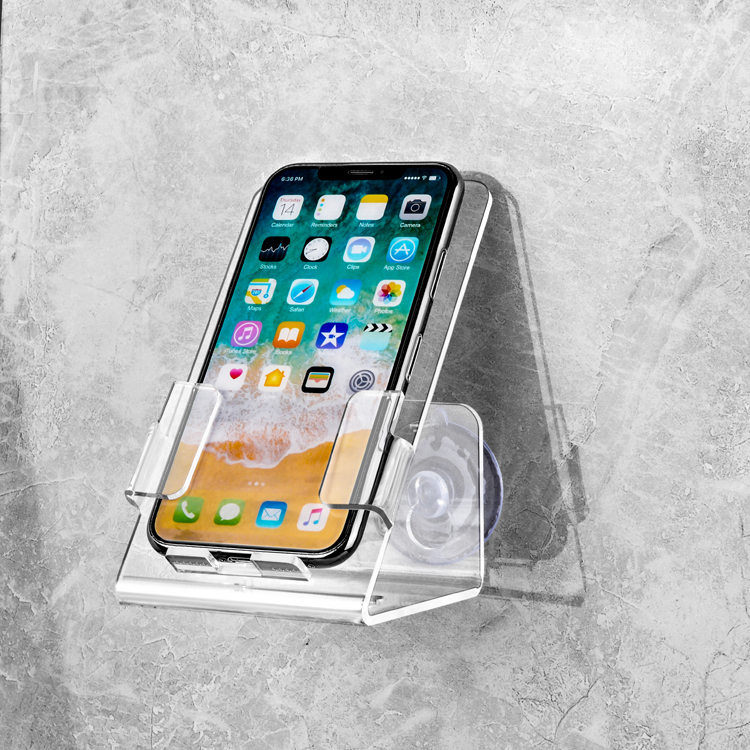 4, we also reserved the gap of the charging line at the bottom of the bracket, you can use the mobile phone while charging, other people’s mobile phone holder does not have this, which means that the mobile phone can not be used. 5, our bracket can be sucked on the bottom of the table you want with the suction cup at the bottom and the shelf will not fall, others do not support this. 6, exquisite color box packaging, can be used as a gift to loved ones, friends. ★ RELAX IN LUXURY- Treat yourself Enjoy your favorite movie, TV shows, podcasts and more while relaxing in the bathtub shower or jacuzzi without holding your phone Enjoy it even more by having stick to your mirror too! ★ FITS ANY PHONE- Works with any smart phone Use it in the shower, Toilet, car, with your water -resistant phone while bathing. or traveling. Drop it in lift it out without removing the protector . It could be easier. ★ SUPER STRONG HOLD- Never worry about A slip. the bath cellphone holder comes with two high strength suction cups to ensure your phone Is Safe. ★ EXCLUSIVE WARRANTY- We Ensure 100% Satisfaction Guarantee! ONE YEAR WARRANTY 100% Refund ( No Hidden Fees ).